I thought I would do a little post about the benefits of dressage in all seats of riding. Before I started jumping and doing all that stuff I rode dressage for 8 years. 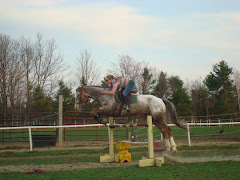 Sometimes reluctantly because the barn I learned to ride at did not like jumping and it was rarely allowed, but it was very beneficial for me. I am not a huge fan of just riding in 20 meter circles and doing things like shoulder in and haunches in and blah blah blah, but I think dressage for me is like eating your vegetables, it's good for ya. My adrenaline junkie nature is always looking for the newest thrill and exciting death defying trick. Dressage makes me slow down and really focus on the details of my riding and getting the best out of my horse. Through the eight years that I rode dressage I feel like I have gained a lot. 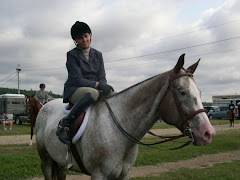 I first learned to ride in a dressage saddle. I remember holding onto the grab strap when I trotted for the first time in the old County saddle. That was a thrill. I learned to have an independent seat. To not only figure out where my seat bones were but to use them as an aid as well. I learned how to make a horse soften to your hands and push up through the bridle and really engage their hind end while slowly shifting weight from their forehand to the hind. But most importantly I learned to feel. I was able to open the line of communication from horse to rider through just feeling. My opinion is that dressage basics are the foundation of all kinds of riding; be that western pleasure, saddle seat, hunters and equitation, and any other kinds you can think of. Dressage is based on control and balance and strength. Being able to have the horse move in any direction at any speed at any moment. Isn't this the ultimate form of riding? I think so. If your moving cows or running barrels you need clean flying changes based on balance. If your jumping a course you certainly need the basics of dressage. The horse needs to be listening to all of your aids, you need to be able to shorten and lengthen strides, collect and just about everything else you can think of. Even if your just a trail rider it's important that your horse has proper balance and can move off your seat and legs. You need a horse that has good transitions, what if you are cantering along and all of a sudden the foot drops out and you need to stop short?? So I just wanted this post to pay tribute to the great art of riding that is dressage. I am super grateful for the fundamentals and basics that I have learned with having regular dressage lessons. I was showing first level and schooling second level movements when I decided that I really needed to either get serious about it or branch off into another area of riding. It was then that I went to college and was able to have my first instruction in jumping and all I can say is man I'm glad I had my dressage background! I think every rider should be able to ride a training or even first level test with their horse. Dressage is great for the horse. When done correctly it creates a nice top line, strengthens your horse, gets them used to using the powerhouse that is their hind end and increases communication between the rider. It's kinda like stretching every morning before you work out or even start your day, it's good for everyone involved. Remember, it's like eating your vegetables, It's good for you!! !